Stay up to date with River Lane Ranch! Her Story: Anise has the size, conformation and temperament to be the perfect choice for our program. She is a few years away from being one of our breeding mares and of course, will go into our specialized training program first, but she is going to have some amazing babies here at the ranch for our program. She is a stunning solid black with four white feet and a beautiful blaze on her head. She is as sweet and calm as they come. Her dam brings some height at 14.2hh, while her famous sire, SD Woolly Mammoth contributes excellent proportion and great bone, mane and feather. 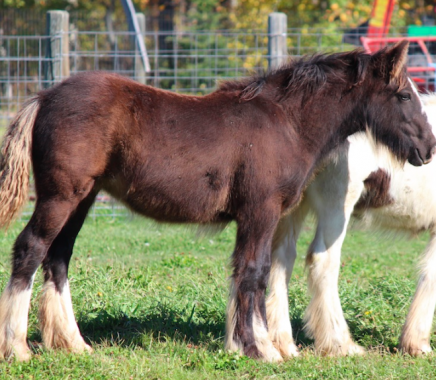 Anise is expected to mature to about 14.1-14.2hh. We are very pleased that North Fork gifted us with this girl. Watch out Gypsy world! Anise is coming!